Slatwall panels are normally delivered via common carrier/semi-truck on a banded skid that is slightly larger than the panels. Slatwall panels are heavy, each approximately 85 pounds for a 4’ x 8’ panel without any aluminum groove treatments. The drivers are not required to help unload the panels, so make sure you have enough help to unload. A pair of tinsnips will come in handy to cut the metal banding. Check the panels for any damage from transit. If damage has occurred, note it on the delivery paperwork and call our customer service department. Keep in mind that minor damage to any “stacking” lip can usually be concealed in the groove. Also, in a normal installation there are usually a few panels that have to be cut shorter than their original length - so consider using any damaged panels for cutting to size. Stack the panels on top of at least 3 equal thickness boards/spacers, or back onto the skid they were delivered on. Do not stack panels directly onto a concrete floor. It is good to let the panels equalize in temperature and humidity with the space they will be installed in. Note: it is normal for slatwall panels to take on a slight warp since they are laminated one side, and the process of grooving relieves some internal stress in the boards. Why is Anchor™ Core better than MDF core? Anchor™ Core, made by Boise Cascade™, is specifically engineered for retail display panels. Made from 100% recycled wood fibers, Anchor™ Core delivers impressive holding strengths and is available at the same price as MDF core. Testing results produced across 35 data points using a load cell system on ¾” panels–MDF 130 grade and Boise Cascade™ Anchor™ Core. Data reflects break-out points for each combination of cores and inserts. This chart is designed to illustrate the relative strength comparison between substrates and various decorative slatwall groove insert options. This is provided to aid our customers and help them choose which core or insert will be the best for their particular application. Results are based on using 3” on-center (o.c.) slatwall grooves and a load cell system 12” out from the center of the panel. Panels were not adhered with fasteners. Failure was measured in pounds of force needed to break out the testing device from the test piece.This chart illustrates break out points and does not reflect recommended load capacities of any substrates or insert options. Due to various influential factors, Wind Mill does not guarantee any load capacities for MDF or Anchor™ Core. The above chart represents testing 3” on-center Anchor™ Core and MDF with various insert options. The chart illustrates the relative strength comparison between substrates and various insert options. The chart, illustrating breakout points, should be used only as a guide to help select which core and insert will be the best option for specific applications. The chart should be used as a reference guide only. It is not recommended to be used as a load capacity of substrates or insert option solution. 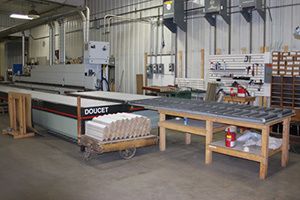 The test was performed using 3” on-center slatwall grooves and a load cell system 12” out from the center of the panel. Panels were adhered without fasteners. Failure was measured in pounds of force necessary to breakout the testing device from the panel. Test results were produced across 35 data points using a load cell system on ¾” MDF 130 grade and Boise Cascade™ Anchor™ Core panels. Data reflects breakout points for each combination of cores and inserts. Testing results produced across 35 data points using a load cell system on ¾” panels–MDF 130 grade and Boise Cascade™ Anchor™ Core. Data reflects break-out points for each combination of cores and inserts. This chart is designed to illustrate the relative strength comparison between substrates and various decorative slatwall groove insert options. This is provided to aid our customers and help them choose which core or insert will be the best for their particular application. Results are based on using 3” on-center (o.c.) slatwall grooves and a load cell system 12” out from the center of the panel. Panels were not adhered with fasteners. Failure was measured in pounds of force needed to break out the testing device from the test piece.This chart illustrates break out points and does not reflect recommended load capacities of any substrates or insert options. Actual load capacity may be less, may vary, and will depend on: Type of slatwall accessory used and the weight of the accessories for the application Distance the accessory extends from the face of the panel Number of accessories used to support the merchandise or application Distribution of weight on the accessory or system used Distance the accessory is from the edge/end of a panel Proper installation Length of groove or insert Other environmental factors Due to various influential factors, Wind Mill does not guarantee any load capacities for MDF or Anchor™ Core. The above chart represents testing 3” on-center Anchor™ Core and MDF with various insert options. The chart illustrates the relative strength comparison between substrates and various insert options. The chart, illustrating breakout points, should be used only as a guide to help select which core and insert will be the best option for specific applications. The chart should be used as a reference guide only. It is not recommended to be used as a load capacity of substrates or insert option solution. The test was performed using 3” on-center slatwall grooves and a load cell system 12” out from the center of the panel. Panels were adhered without fasteners. Failure was measured in pounds of force necessary to breakout the testing device from the panel. Test results were produced across 35 data points using a load cell system on ¾” MDF 130 grade and Boise Cascade™ Anchor™ Core panels. Data reflects breakout points for each combination of cores and inserts. Boise cites their secret formula for the correct measures of wood fibers, glues, resins, binders, and pressing times. MDF (medium density fiberboard) slatwall is produced from a 48 lb. medium density fiberboard (MDF) and has an internal bond strength of 110 lbs. per square inch. Other plywoods, veneers, fire-rated and 150 lb. internal bond boards are available on request. Composite wood is a popular material for consumer products because of its design flexibility, structural properties, and inherent environmental benefits. In particular, particleboard and MDF are manufactured from recycled and recovered wood residuals and other by-products diverted from the solid waste stream, making them among the greenest building products in the world. Painted panels are produced using acrylic water-based or lacquer applied approximately 2-4 mls. thick (depending on the color - black is a lacquer finish). These finishes meet all EPA requirements and cure in approximately twenty-four to thirty-six hours. Other epoxy and latex finishes are available on request. Grooves are finished with an acrylic lacquer tinted to customer specifications. Wind Mill can paint to match any color of the rainbow. To achieve a good color match, it is recommended that an original sample be sent, a test sample produced and sent back to the customer for final approvals. Wind Mill’s melamine is a post-impregnated (top foil) melamine paper adhered under heat and pressure directly to MDF board. It provides an excellent alternative for vertical applications. In comparison to thermofused melamine, the top foil should be viewed as a lower cost, superior product with a more desirable finished appearance - that manufactures and repairs with a greater ease and does not present a dull finish or brittle chip-out problems. Wind Mill has 11 stock Melamine panels: white, antique white, black, gray, light gray, mahogany, birch, maple, oak, brushed aluminum, & almond. Wilsonart, Formica, Nevamar, Pionite, and other brands of high pressure laminates are available. These products come in vertical (.030”) thickness as well as standard and post-forming grades (.050”). This product is a .080” thick acrylic polymer sheet with a silver colored backer and adhered with a polyvinyl acetate (PVA) glue to an 11/16” MDF board. It comes with a paper mask to protect the surface. The wood veneers are rotary cut in a .035” thickness. These panels have a veneer backer to achieve balance. Red Oak, Birch, Knotty Pine & Maple are in stock, other species and special cuts are available on request. Slatwall formaldehyde emission measures .3 parts per million (PPM) or less. This complies with the EPA standards set forth for these materials. 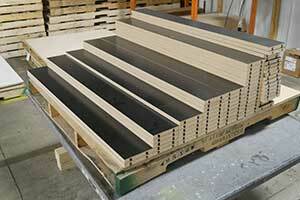 No added urea formaldehyde MDF boards are available on request. The adhesive used in the cold press laminating line is a cross-linking emulsion. This produces a type II water resistant bond for use with hardboards, particleboards, wood and other similar materials, and meets all EPA requirements. The hot melt adhesive used with the melamine line has no ingredients listed as carcinogens or potential carcinogens by the National Toxicology Program. 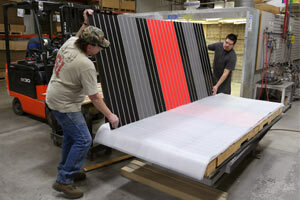 Panels are placed on a skid with corners and edges protected for shipment via common carrier. The aluminum inserts used in slatwall are extruded 6061 or 3003 wrought aluminum with a silver mill finish. The aluminum inserts more than double the strength of the panel. They can be painted to match any color. The vinyl inserts are HIPS (High Impact Polystyrene) - and are PVC Free. They are available in 5 colors (white, gray, almond, red and black). The vinyl inserts are primarily decorative - adding little appreciable strength to the grooves. Board length and width + or - .0625”, squareness + or - .125” diagonally. groove dimensions : groove - .25”,lip .25”, back .25”, opening .375”. Recommended Uses: Fire-rated laminate is recommended for interior applications where fire codes specify or the environment suggests a fire-resistant and smoke-resistant surface. It may be applied as decorative surfacing for slatwall, display panels, and component parts. These laminates are particularly appropriate for public places like airports, hotels, office buildings, and institutions such as hospitals and schools. Fire-rated laminate can offer a Class 1 or A fire-rating, provide fire-retardant adhesives and substrates are used. Vertical Surface (VGF) Type 604: Intended to surface walls in public spaces and corridors. General Purpose (HGF) Types 605 and (SFG) 607: Produced for both horizontal and vertical applications. Fire-Rated Backer Type 264: A stabilizing backer sheet for applications where decorative surface is Vertical Surface Type 604. Fire-Rated Backer Type 266: A stabilizing backer sheet for applications where decorative surface is General Purpose Type 605 or 607. The decorative surface is composed of melamine resin-treated decorative surface papers. Special kraft core sheets, used to obtain the desired thickness, are impregnated with phenolic resin. Wilsonart Laminate is intended for interior use only and should be protected from continuous exposure to direct sunlight, extremes in humidity and temperature greater than 275°F (135°C). It is not structural material and must be boned to a suitable substrate. Wilsonart Laminate should not be used as direct covering for plaster, concrete walls, or for gypsum wallboard. It should not be exposed to flame, molten metal, metallic sparks, or intense, direct sunlight. Nor should it be used as a cutting surface. We recommend that if you are installing slatwall panels over a steel stud wall system, to place wood blocking of appropriate size behind the steel stud and within the stud cavity. This will provide important anchoring for screw fastening. The screw can then travel from the slatwall panel groove, through the pre-drilled hole in the metal stud then into the wood block. One of Wind Mill’s greatest strengths is lamination. Our capabilities include both top foil overlay melamine (14 stock colors), as well as high pressure laminates, with Wilsonart, Formica, Nevamar, and Pionite being the most frequently requested. Additionally we offer specialty solutions for our customers. Developing unique bonding methods. Examples include copper foil to Anchor™ Core for RF shielding in hospitals and dECOleather, repurposed leather for high-end retail environments. If you have a custom lamination need we’ll solve it! Wind Mill has strong capabilities in edge banding. 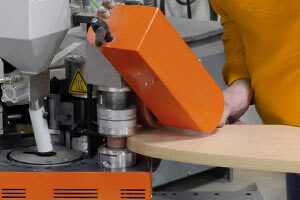 Our straight edge banding equipment can handle thickness of up to 3 mm, at a rate of 25 meters per minute. We can quickly and professionally deliver the edge banding solutions your projects require. Contact our expert Project Managers for additional details. 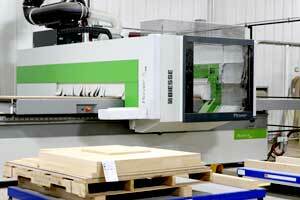 Wind Mill’s contour edge banding capabilities can process large and small pieces alike without extra set-up. Performing both concave and convex edges, 10-60 mm in width. Wind Mill does more then just straight lines. Contact us for custom component parts and more. Our years of experience ensure the highest material yields with minimal waste. Wind Mill CNC capabilities include numerous state-of-the-art machining centers capable of milling board faces, slatwall edges, solid panels, and component parts for assembly and various panel display systems in addition to gondolas. We routinely change component part sizes to accommodate small, medium and large runs. 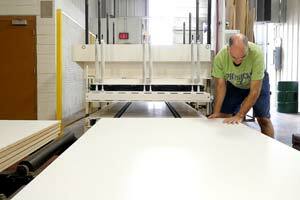 Wind Mill specializes in custom paint and stain finishes for panels, grooves, inserts, and edges. Water based finishes are used on ready-to-finish (RTF) panels for quality control and the betterment of the environment. Short runs can be cost competitive and offer excellent part quality. No hard tooling is required. This allows for immediate design modifications, we can reprogram your part to new specifications quickly and easily. Look to Wind Mill for competitive prototyping solutions. Wind Mill works with your team to maximize packaging efficiencies, assuring your product makes it safely to its destination. Extra labeling and nesting appropriate pieces for offloading and further assemblies increases productivity and reduces costs.